The default name input of rmxp is AWFUL so I searched for a new scene_name. Sadly i didnt found one I liked, so I made one myself. 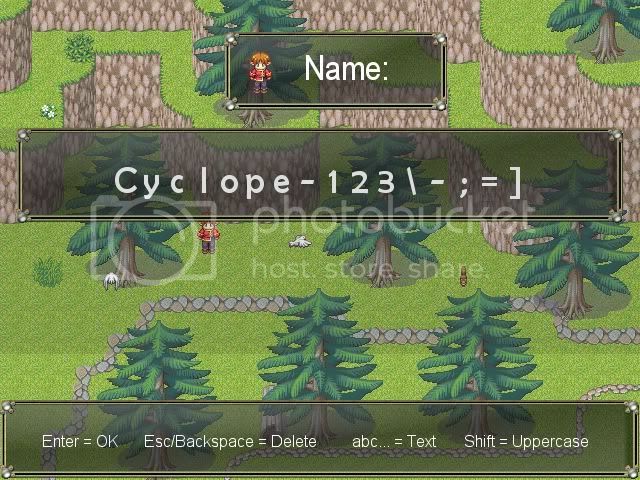 This script is for anyone who wants a beter name input!! #Change this text to whatever instructions u want to have! # This window is used to edit your name on the input name screen. # This window is used to select text characters on the input name screen. # This class performs name input screen processing. *LVLsUP! * thanks!, but can you move while doing that? I was about to ask if it handles language locale identifier modified input when I realized that you were using my input module. xD Nice job. Very awesome. I really like this! I guess you could have worked on the placement of the text a bit more but I really like it! Do you mean in the placement of the text of the instructions or the place where the text apear when you type it? Both. To me it seems as the top window have the text a bit lower than the middle, and the lower window have different space between the text rows. That was a really nice improvement. Like it! ¿¿¿¿¿¿Does any one have any suggestion????? Whoa... I will use that in the future. That's so great!!! I would say it's very simple and very good in the same time. yey! finally moved to the database!!!! This is a good script, but it would make it even better if you added compatibility with facesets from Tons of Addons, which would probably be fairly simple. does it hav incompability issues with it???? ?